With the 4th of July festivities happening throughout this weekend, --- games, parades, concert, reunions, sale are all over the country. Why don't you also show your support for it by buying Made in America products like jewelries where you can find on Visible Interest --- the only online jewelry store featuring modern jewelry created by hand or in small batch processes by independent jewelry designers and artisans. It focuses on a jewelry with a very modern aesthetic from industrial chic to minimalist looks. Jewelry ranges from hip fashion looks to fine metals and gemstones, all decidedly modern in a variety of prices to fit any budget. So, show your support for small US businesses. Have a positive impact and look fabulous doing so. Visible Interest is among those great businesses that also love to feature Made in America products. In fact, Visible Interest made ABC World New Tonight’s Made in America List both in 2013 and 2014. 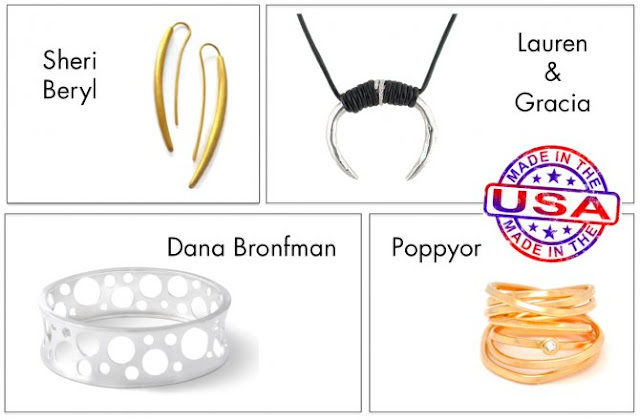 To check all their Made in USA modern jewelry, go to Shop By Category and select Made in USA in the dropdown menu, then search by type of jewelry including earrings, necklaces, bracelets and rings. All of their jewelry is designed by American artists and craftsman. Their selection of modern jewelry pieces is gorgeous and there is always something for everyone whether you're treating yourself or buying a gift. Visit Visible Interest and Shop Now!